The cashmere coat it is! A weaving publication has expressed interest in the cashmere coat, and it’s got a tight deadline: the photo shoot is just two months away! Â For a couture coat, with an as-yet-unfitted sewing pattern, that’s practically nothing. Â In fact I’m not sure why I agreed to it, but I did – perhaps because I was thinking of doing it anyway, and I love the suspense of a tight deadline. Â And there’s nothing wrong with being published, of course! This is basically a vest combined with a cape. Â The vest front will be black suede, with red-and-black buttons. Â The cape will be the Celtic braid fabric, with the stripes running down the front, lined with black silk charmeuse. Â I haven’t yet figured out what fabric for the back of the vest will be – possibly the same silk charmeuse, possibly a wool suiting. Â (I don’t have enough suede to do the back.) Â The collar will be a contrasting fabric – perhaps the black silk charmeuse or the Celtic braid fabric with the stripes running lengthwise. Â A trip to Britex Fabrics may be in order! So, today I am working up my first muslin for the Celtic Braid Coat. Â (I’m renaming it from “the cashmere coat” because I think it’s more descriptive.) Â If I have time, I’ll do the first round of alterations before Sharon comes by on Sunday to help me with a second fitting. Â Usually it takes three or four rounds to get things perfect, so there’s no time to lose! Meanwhile, we have harvested our first cucumber and a handful of beans from the garden. Â The butternut squash is really cranking out babies (unlike the zucchini which is taking a more leisurely pace) – I’ve counted seven or eight so far, with more yet to come. Â I’d take Julia’s suggestion (from a previous post) and eat some of them young, like zucchini, except that mature butternut squash is my favorite vegetable and I can’t bring myself to sacrifice delicious butternut squashes for the sake of a better-tasting zucchini. Â Perhaps next year I’ll plant two butternut squash, one to produce mature fruit and one for eating young. Â There is plenty of space in the backyard, after all! Â We are “farming” only about 1/3 of it so far – next year we’ll likely do more, and prepare the beds better. Â I love gardening, especially since we finally have enough land to do it. Â I remember fondly the days when I had an 1800 square foot garden, and grew 83 tomato varieties (and a dizzying array of other vegetables!). Off to the farmer’s market! Â When I get back, I’m going straight to work on that muslin. Which just points up that common sense is hardly “common”: it’s wisdom that comes from experience and study. Â That which is common sense to an expert may mean hours of pondering and experimentation for the novice. Â I am pleased to note that I am starting to develop “common sense” for pattern drafting. Â Hooray! I was still mulling over the jacket fabrics as I drove up to see Sharon.Â I really loved the diamond pattern, but wasn’t convinced it would work. Â Sharon thought it would work just fine, and after seeing myself pinned into the jacket muslin, with the diamond pattern draped over the jacket front, I agreed. Â In fact it may work better than the Celtic braid, so that’s what we’re going to do. Â I will resley the loom and start weaving the yardage for the jacket – 8 yards ought to be more than plenty. Â The pattern still needs one more set of tweaks (and Sharon says I really need to learn how to set in sleeves; apparently my sleeve-setting is horrendous), so I will do one more muslin as well. Coat: the coat pattern, as it turns out, is just about fine the way it is! 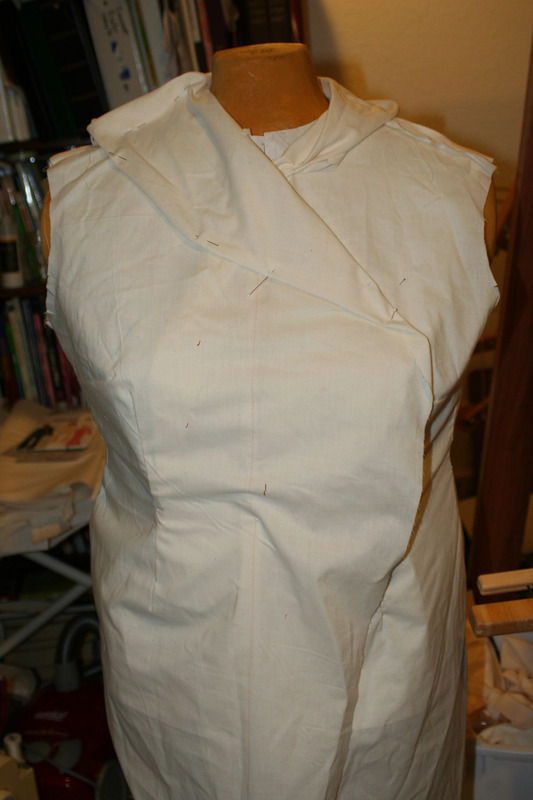 Â As with the jacket, there are still a few tweaks that need to be made, so another muslin is in order. Â But it’s almost ready for prime time. It really needs to be used with a subtler allover pattern, something that will be interesting but which will not clash with the collar for attention. 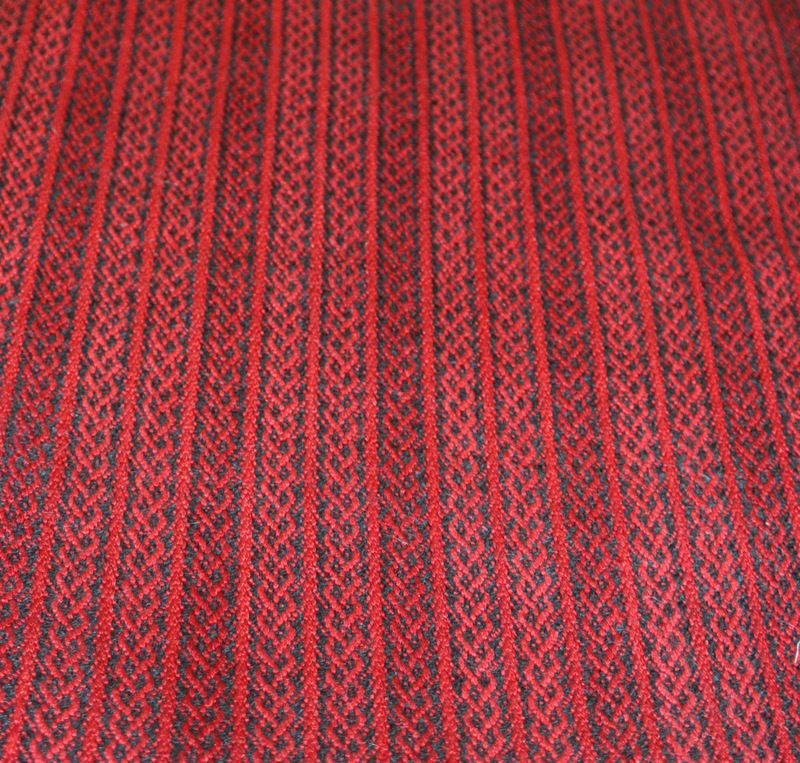 Â So, oddly, developing the pattern to a good design has eliminated its suitability for its original purpose, which was finding a use for the Celtic braid fabric! The part you must jettison is not only the best-written part; it is also, oddly, that part which was to have been the very point. Â It is the original key passage, the passage on which the rest was to hang, and from which you yourself drew the courage to begin. The unfortunate truth is that the stripes clash with the flow of the coat. Â So it’s time to let them part ways, and find something else to do with the Celtic braid fabric, while developing a fabric to suit the design of the coat. I will probably rework this draft a couple of times before declaring it suitable, but it will be a good base for the coat pattern: subtle enough to be interesting close up, but not so bold as to draw attention to itself. Â I want the clear focal point on the coat to be the dramatic collar (which also draws attention to the neck and face), and a strong fabric pattern will muddle that. I have not thought about colors yet. Â I’d like to have strong colors in the collar at least – Sharon is suggesting blues and greens or blues and purples, but I’m more attracted to red. Â (Hey, you knewÂ I was a drama queen!) Â Because I can’t dye leather dependably (and I do want a leather collar), I think I may approach the problem by buying the leather for the collar first, then designing a fabric around the collar, rather than trying to find leather after the fact. Â This is a great occasion for a trip to Leatherwise, a shop in Santa Cruz that specializes in fantastic leather. Â I will probably go down two weekends from now – I’m booked next Saturday and they aren’t open on Sundays. 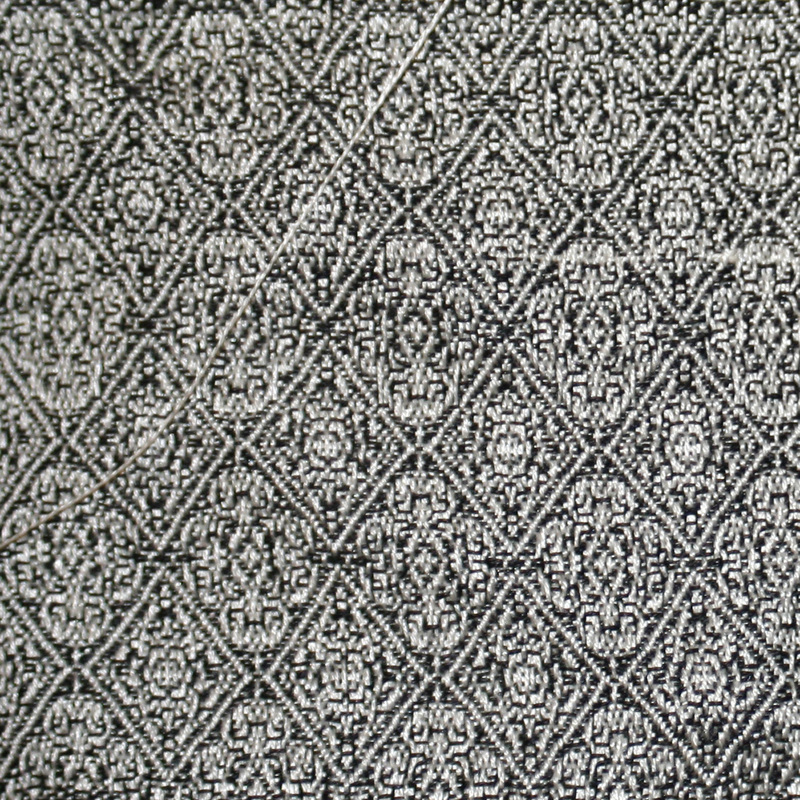 Meanwhile, I have not forgotten the Celtic braid fabric. Â Sharon suggested making a cape or a cloak from it – the long lines would go well with simple rectangular shapes, and I have (more than) enough to make a very nice cape. Â I borrowed one from Sharon that I think would work well, and will take the pattern off the garment and make myself a mockup in fleece before proceeding with the Celtic braid. I won’t be seeing Sharon until late September, though, due to conflicts in both our schedules. Â So that gives me plenty of time to adjust the patterns, redesign drafts, and finish that article for Handwoven. Â I will weave up the samples for it today and tomorrow, and hope to get back to my own weaving this week. So it looks like I have my work “cut out” for me! Aside from a few problems (most notably that I accidentally flipped the collar right to left), it works and looks pretty good. 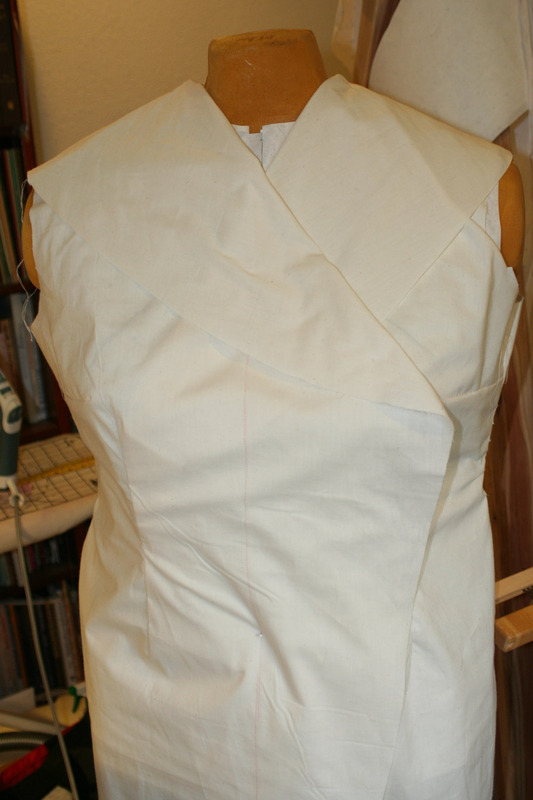 Â I’m very pleased with my first attempt at drafting an asymmetric collar. 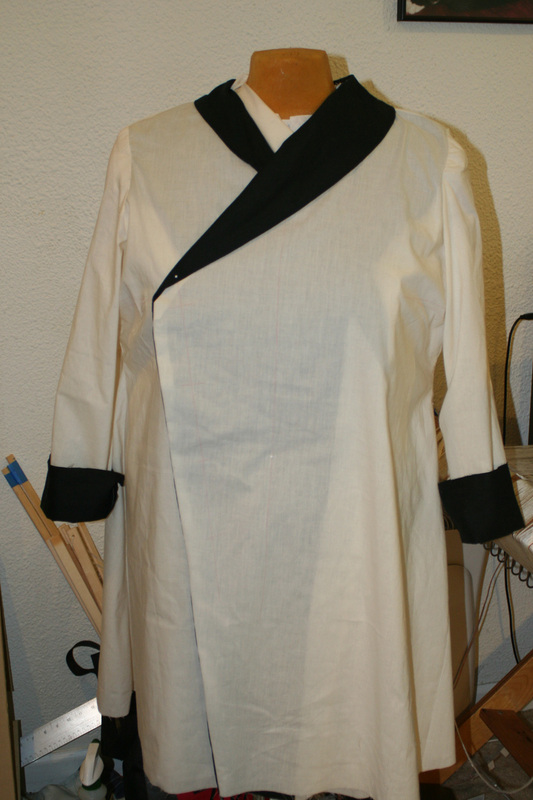 I’m not entirely satisfied with the fit of the coat muslin on the dress form – there are a LOT of fitting issues – and I think I may have added too much flare at the bottom, but these are all correctable, with Sharon’s help. I took up the muslin to Sharon’s and I did indeed get it right. Â However, Sharon thought the overall design was boring (too traditional), and together we tested out some other alternatives – a few of which I liked better. In this case, we still have the dramatic collar with the Celtic braid and black border, but the collar is smaller and tapers as it reaches the opposite side, disappearing just at the point of the neckline. Â The pocket will be black and red, with the line of demarcation paralleling the line of the larger collar section. Â We kept the buttons going diagonally down the front, Â though Â they aren’t shown in the sketch. Sharon also suggested that I change the design from a fitted, darted straight line (which she felt would be too rigid when combined with the stripes) to a swing coat – minimally shaped and slightly flared at the bottom. Â This, per Sharon, would give a looser feel and still be flattering. Â Since I’ve never tried on a swing coat, I have no idea if she’s right, but I figure it’s worth a try. Â So I will be trying to mock that up as well. 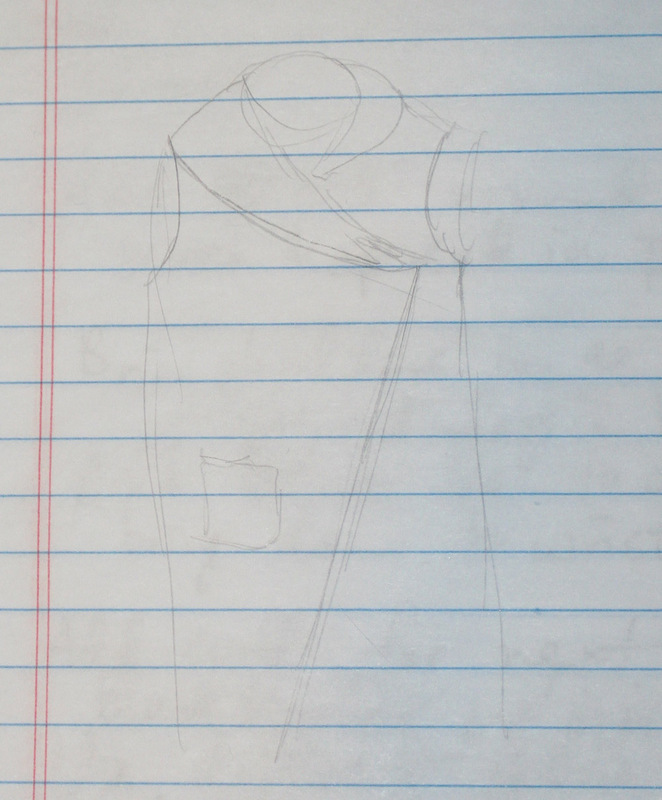 Of course, I’ve never tried drafting an asymmetric collar or a swing coat (this is only my third or fourth attempt at drafting, after all), but Sharon gave me rough instructions and I think I can figure the rest out. Â I’ve got three weeks to do it, which should be plenty of time – I’m busy next weekend and Sharon is busy the week following, so we’re meeting up in mid-August to catch up again. Â We’ll review muslins for the jacket, the coat, the kimono jacket, and the sloper which I’m going to draft based on the measurements Sharon took yesterday. Â Lots of stuff to do, and happily, plenty of time to do it in! Meanwhile, I’m turning my attention back to weaving. Â I’ve decided to weave off the rest of this warp before installing the Fireside rolling temple (now that we’ve got the placement down, the fabric is very much in the way) and after that I’ll throw on a warp for the Handwoven article I’m working on. Â That should be quick and easy (we’re talking mug rugs here), so I think by mid next weekend I’ll be threading up the loom with that 37-yard warp, and starting to weave the samples for all that yardage. Off to pit some cherries! I cut and sewed the coat muslin this morning.Â My first attempt failed spectacularly, but the second was spot on! I totally win!Â Not only did I successfully draft a pattern of my own design (and differing substantially from any “in the book”), but I managed to troubleshoot and correct the pattern when it failed initially. I’m guessing I will finish most of the muslins, get the strawberry jam into the sheet pans for sun-cooking, and get the rolling temple on the loom.Â I will probably pit the cherries for a cherry pie, but make the actual pie tomorrow – though one never knows: I might have more time than I expect.Â But since Mike and I are going out for breakfast in a bit, it seems unlikely I’ll get much more than that done. Still, three out of four (projects) ain’t bad!